Home buyers would scan through newspaper classifieds, circle the ones that interest them and call an agent to visit the site. Now with the advent of technology, the entire way of marketing, searching, and buying properties has changed. Today, there are innumerable number of property listing websites such as Magicbricks.com, JustProperty.com, RealEstateEgypt.com, Zillow and Redfin that list properties based on location, budget, property type etc that allows the prospective home buyer to scan through various properties, check the amenities available, check the online reviews and images of the property and then book a site visit. The process has become simple because of the freedom to compare and choose from an array of options. However, though technology and aggregator sites spell as an advantage for home buyers, it is no different for real estate companies who continue to spend money to list the property on the aggregator websites. The real estate companies have to compete with other companies to grab the attention of the buyers. It can become difficult especially when your project is among the hundreds of properties displayed in the website. For example, we tried finding a flat between Rs 30 lakhs to 40 lakhs in a place called Navi Mumbai in India. We found 3,908 projects on the website. When we filtered it further according to the top location and construction status, the result showed 399 properties. You can, of course, pay a premium to feature your property on the top of the list and to receive a badge that says the property is verified or trustworthy. 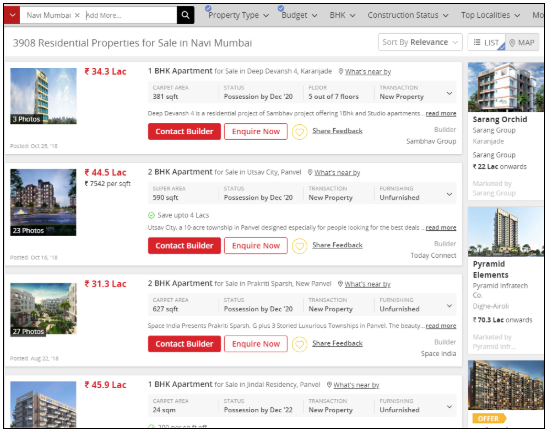 Some real estate aggregators websites like magicbricks.com even offer digital marketing services to select premium developers. However, it might not guarantee you a qualified lead or could be restricted to a select few who can spend a million dollars on marketing. That’s why a real aggregator website cannot be the only solution to generate leads. You will have to take a holistic approach to generate leads and convert them into buyers. Digital Infrastructure - Why It’s Better Than Aggregators? As you saw in the above example, a person looking for an apartment in a part of Mumbai city has to choose between 300 to 3000+ properties. While there are many options to choose from, there is also a chance of getting overwhelmed by information overload. This is where digital infrastructure comes to rescue. Today’s buyers are used to customer-centric services. They prefer to engage with brands that understand them, their likes, and their behavior. With digital marketing, you can reach out to the buyer where they are and offer them personalized information to engage with them. For example, you can use the location-targeting option provided by Facebook to show ads to those people who have liked real estate pages on Facebook and reside or have visited the place where your property is. This way you can cut through the clutter and reach your prospective buyer before your competitor does. Most buyers visit a site based on the property images they see online. Optimized images not only ensures that the images load faster without compromising on the image quality but also ensure that the images are easily searchable when the buyer checks for properties online. Real estate aggregator websites might not optimize the images or might shrink it to a specific size, which can compromise the quality of the images. But, with digital marketing, you can ensure that your images and even website are well-optimized and easily searchable by the users. According to a report by Forrester, 99% of the marketing professionals said that creating an omnichannel view of their customer is going to be their primary focus. Today’s customers seek experience and connecting with them through multiple touch points makes it easier for the brands to create a wholesome and seamless experience for the customers. With real estate aggregator websites, you can list your property. However, you cannot use it to engage with the buyer on different digital platforms the way you want. However, with digital marketing, you can show ads and engage with the buyer on various channels. For example, you can use Google AdWords to advertise your property. If a prospective buyer visits your website on clicking the Google Ad and closes the website without taking action, you can use remarketing option to display your property ads to them. Constant display of ads will remind or entice them to revisit your website. Every real estate aggregator has a different method of generating leads. Some websites consider leaving a query on the property as a lead and charges the builder, while some consider leaving a ‘request a call back as genuine lead’. The lack of uniformity in the definition of what comprises a genuine lead can create confusion and increase the cost per lead (CPL). With digital marketing, you can determine the definition of a qualified lead and pay only for those that are authentic. For example, we increased the number of qualified leads for one of our clients, VBHC, by 300% and reduced their CPL by 150% by using Facebook ads and Google AdWords. Digital marketing also simplifies the process of tracking leads. Unlike real estate aggregator websites that share the leads with various agents who engage with your buyers on your behalf, digital marketing shares the leads with you, which makes it easier for your sales and marketing team to determine the genuine ones and focus on only those that show a possibility of converting. 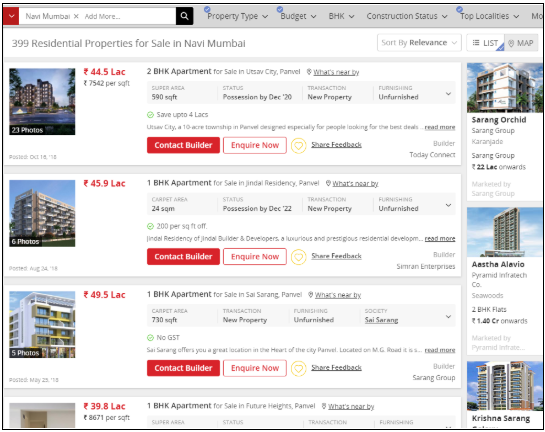 Should You Shun Real Estate Aggregators and Focus on Digital Marketing? We will not recommend that to you. Omni-channel contact with your buyer is important to remind them of your presence. Real estate aggregator sites are one of the channels through which you can reach your buyers. In fact, aggregator sites are the first that a buyer will visit to check a property unless they have already decided to invest in your property. So, do not shun the aggregator websites. Keep your listing active. However, fortify your lead generating exercise with an effective digital marketing strategy. Combine them both to build an end-to-end experience for the buyer. Fractional CMO is one of the few digital marketing agencies that specialize in creating a digital marketing strategy for customers. We are also a HubSpot agency partner, so that helps us to leverage the amazing HubSpot tools and their inbound methodologies to improve the digital marketing strategy. If you need assistance in planning your digital marketing roadmap, contact us for a Proof of Concept. We will be happy to help.